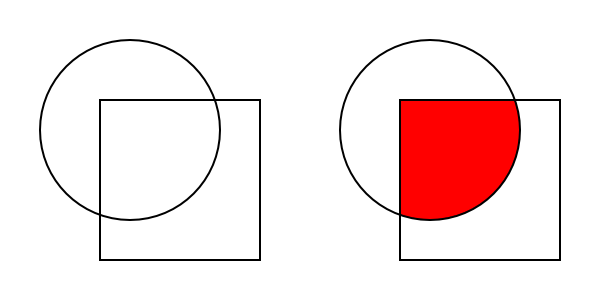 The simplest use is to fill an area defined by two different objects. Select the Strumento Riempimento ( , Shift+F7) from the Casella degli Strumenti and then click in the overlapping region. A new object is created with the current Riempimento color. Left: Before Paint Bucket fill. Right: After clicking on the overlapping region with the Strumento Riempimento (with the Riempimento color set to red). The cursor position when clicking determines the starting point of the fill region. The filling algorithm recursively adds neighboring areas to the region until pixels are found that don't meet the criteria determined by the parameters in the Controlli Strumento. The gray areas have been filled by clicking on the centers of the rectangles with the Strumento Riempimento. 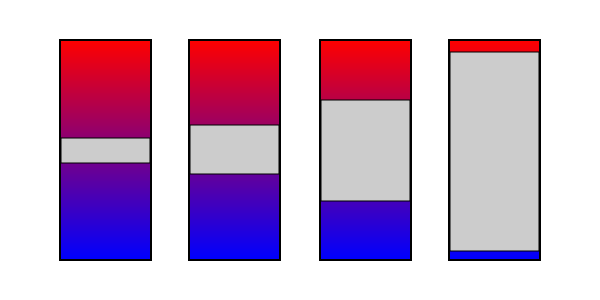 From left to right, the Threshold parameter was set to 5, 10, 20, and 40. The circles were first filled with a blue to green gradient. The gray areas were created with the Strumento Riempimento by clicking on the centers of the circles. In both cases, the Threshold parameter was set to 10. The Fill by parameter was set to Visible Colors on the left and Red on the right. 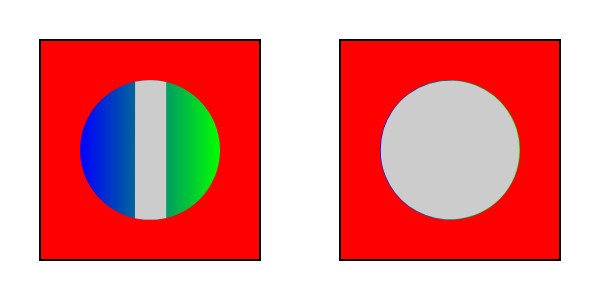 With a value of Red the blue and green of the circle are ignored in the color matching, thus the bucket fill area reaches the circle's edge where there is a large change in the red level. Holding the Ctrl down while clicking on an object with the Strumento Riempimento will set the Riempimento and Contorno to the current style without preforming any filling.